Radical constructivism may find an aesthetic counterpart in beautifully crafted educational narratives used for example in cabbalistic teaching and Zen-buddhism. These short stories are often recursive, layered, or self-denying because of their complex topics (e.g. existence, epistemes, agency), but nonetheless beautiful to behold. A young student once asked a renowned teacher about the nature of knowledge. 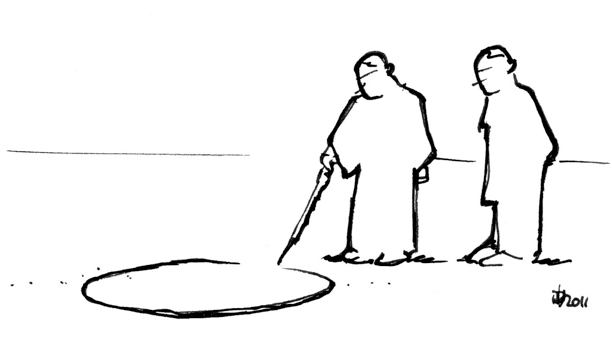 The teacher drew a circle in the sand and explained: Within this circle is that, what we know, and on the outside is that, what we do not know. We may build our lives on what is within the circle, getting proficient and skilled in the application of what we know. We may also strive to learn what is on the outside, on what we will know one day or may never know at all, becoming proficient and skilled in widening the circle. Or we may think about the thin line of the circle itself, of how it is created, and what its nature and purpose may be. Two monks were watching a flag flapping in the wind. I found Zen Koans to be a wonderful example both for an enticing, beautiful crafted educational narrative, and for ‚mental hacking‘ – searching for a solution to a (yet) unsolvable problem, which in turn leads to a higher state of perception.